Description: Marcus Jones reports that the Black Political Task Force has announced its candidate endorsements for the upcoming elections. Footage from a press conference at which the Task Force announces its slate of candidates. Salvatore DiMasi (candidate for State Representative) addresses the audience. The Task Force has generated controversy by endorsing some white candidates over African American candidates. Footage of Georgette Watson and Robert Rufo talking about Black Political Task Force endorsement. Jones interviews Peter Hardie (President, Black Political Task Force) about the endorsements. 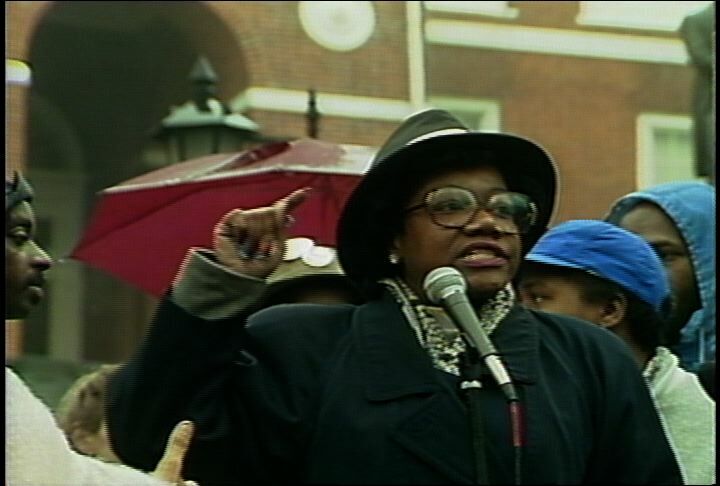 Clips of Jack E. Robinson (President, Boston chapter of the NAACP), Baroness Williams-Martin (political activist), and Regina Placid (candidate for State Representative) commenting on the endorsements. 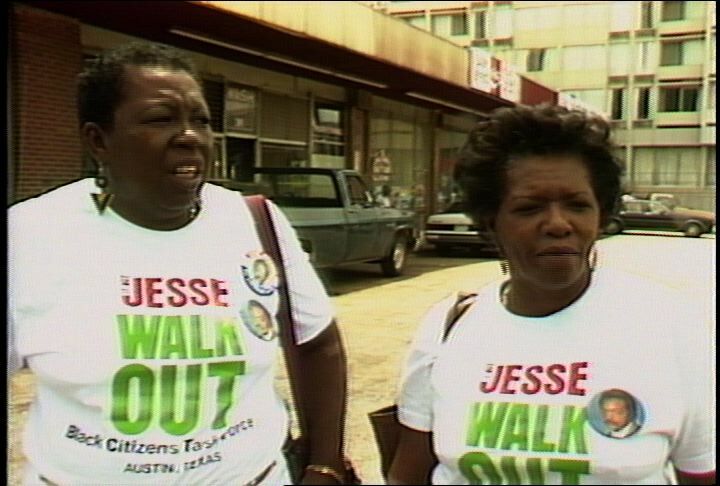 Clips of Mel King (political activist) and Michael Dukakis (Governor of Massachusetts) campaigning. 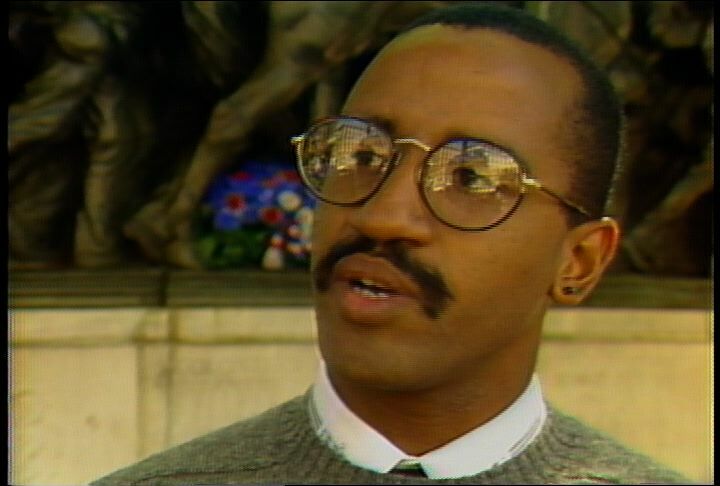 1:00:21: Visual: Footage of Peter Hardie (President, Black Political Task Force) addressing a crowd at a press conference in front of the Robert Gould Shaw Memorial on Boston Common. Hardie talks about the mission of the Black Political Task Force. 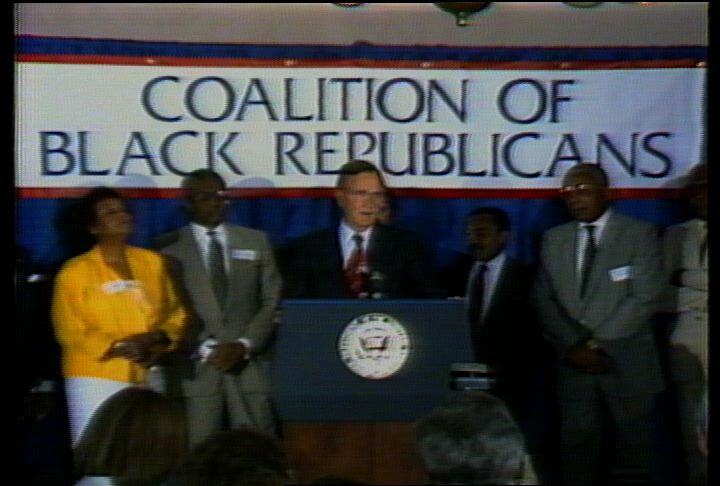 Marcus Jones reports that the Black Political Task Force was started in 1979; that the Task Force is comprised of 60 minority activists who collect dues, hold forums, and endorse candidates. 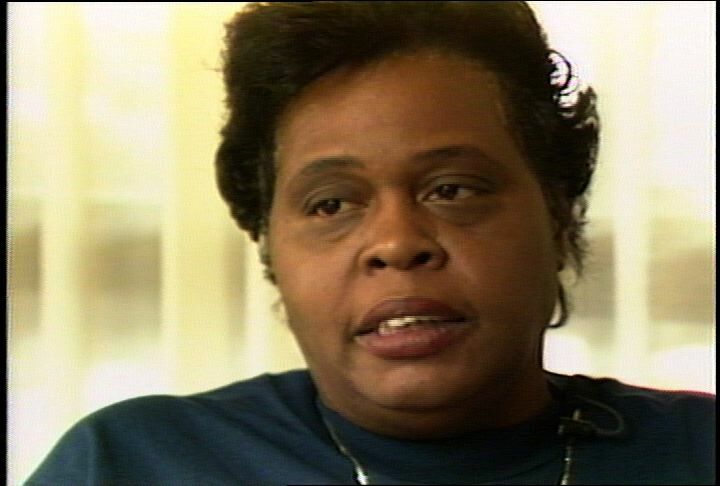 V: Shots of a male Task Force member wearing a Bob Rufo campaign pin; of a female Task Force member; of Mel King (political acitivist) campaigning in Roxbury; of Michael Dukakis (Governor of Massachusetts). Jones reports that the Task Force endorsed Mel King in the 1983 mayoral race; that they endorsed Michael Dukakis in the 1982 governor's race. V: Shots of African American campaign workers holding campaign signs for Georgette Watson (candidate for Suffolk County Sheriff); of Bob Rufo (candidate for Suffolk County Sheriff) shaking hands with Hardie. Jones reports that the Task Force has endorsed Bob Rufo over Georgette Watson in the race for Suffolk County Sheriff. 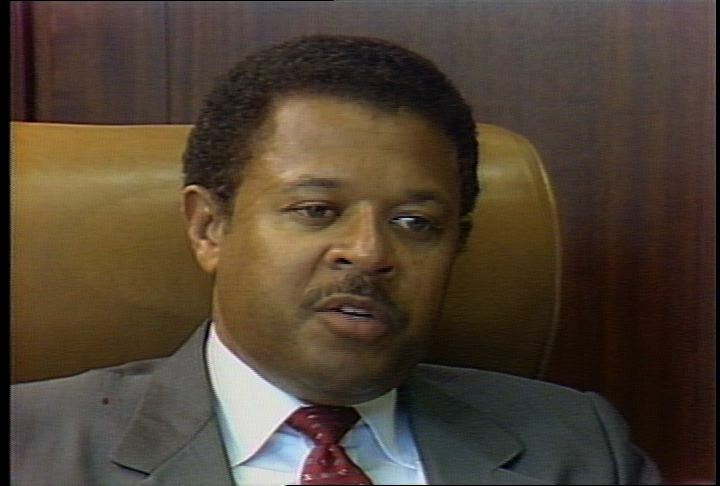 V: Footage of Jack E. Robinson (President, Boston chapter of the NAACP) saying that the Task Force does not always have to endorse African American candidates; that Watson deserves the endorsement of the Task Force because she is a good leader. Footage of Baroness Williams-Martin (political activist) saying that the Task Force's endorsement of Rufo was unfair; that the endorsement was "a political slap in the face to Watson." Jones says that Watson was shaken by the Task Force's endorsement of Rufo. V: Footage of Watson with supporters at a press conference. Watson has tears in her eyes. Watson says that the Task Force's decision has been an "emotional experience"; that she is going to wage a winning campaign. Footage of Hardie at the Task Force press conference. Hardie says that Rufo is a better candidate for the position than Watson. Footage of Rufo saying that the race is important to him; that the voters need to decide which candidate is most qualified for the position. Rufo says that he hopes that the endorsement does not become an issue between him and Watson. Jones says that the Task Force announced its full slate of candidates at the press conference today. Jones reports that the Task Force has endorsed Rufo for Suffolk County Sheriff, Gerry D'Amico for lieutenant governor, Jo Ann Shotwell for attorney general, Byron Rushing for state representative for the ninth Suffolk District. Jones notes that the Task Force endorsed Salvatore DiMasi over Regina Placid for state representative of the third Suffolk District. V: Shots of Rufo at the Task Force press conference; of Gerry D'Amico (candidate for lieutenant governor) at the press conference; of Jo Ann Shotwell (candidate for state attorney general) at the press conference; of Byron Rushing (candidate for state representative) at the press conference. Footage of Salvatore DiMasi (candidate for state representative) at the Task Force press conference. DiMasi says that this endorsement shows that people from different communities and ethnic backgrounds are working together. DiMasi says that he is proud to receive the Task Force's endorsement. Footage of Regina Placid (candidate for State Representative) saying that the Task Force's endorsement does not represent the true voice of the African American community. Footage of Hardie at the press conference. Hardie says that the Task Force is accustomed to the controversy which often accompanies their endorsements. Jones stands on the Boston Common. Jones reports that no one can predict if the Task Force's endorsements will make a difference in the upcoming elections. Jones notes that critics of the Task Force say that their endorsements may backfire. Jones says that some critics predict that the African American community may back the African American candidates not backed by the Task Force. 1:00:11: Visual: Shots of a breakfast meeting of the Black Caucus. Shots of attendees at the breakfast including Byron Rushing (State Representative). Meg Vaillancourt reports that African American legislators are concerned about the adoption of the budget proposed by the Ways and Means Committee of the Massachusetts House of Representatives. Vaillancourt notes that African American legislators are concerned about cuts to specific areas of the budget. V: Footage of Shirley Owens Hicks (State Representative) saying that cuts to the budget will affect the poor; that many people depend on the services provided by state agencies. Vaillancourt reports that Richard Volk (Chairman, House Ways and Means Committee) unveiled a budget which cuts $582 million from the budget proposed by Michael Dukakis (Governor of Massachusetts); that the budget includes no new taxes. V: Shot of Volk in the House chambers. Volk stands at a podium to explain the proposed budget. On-screen text details some of the cuts included in the budget proposed by the House Ways and Means Committee. Vaillancourt reports that the House Ways and Means budget includes an $8.5 million decrease in rental assistance and a $12 million decrease in emergency welfare assistance. Vaillancourt notes that the budget cuts $6 million from the Department of Social Services; that the budget cuts $20,000 from the Massachusetts Commission Against Discrimination (MCAD). Vaillancourt reports that the House Ways and Means budget increases spending on AIDS prevention, elder services, and drug treatment. V: Footage of Rushing saying that the House Ways and Means budget did not cut some areas; that the budget increased spending in other areas. Rushing says that the House Ways and Means Committee proposed spending more money on drug treatment than Dukakis did. Shot of the Massachusetts State House. Vaillancourt reports that legislators are aware of the popular revolt against new taxes; that the minority community may be more receptive to the governor's call for new taxes. V: Footage of Rushing being interviewed by Vaillancourt. Rushing says that his constituents favor new taxes; that many voters all over the state probably favor new taxes. Rushing says that many state representatives are not listening to their constituents. Footage of Owens-Hicks being interviewed by Vaillancourt. Vaillancourt asks Owens-Hicks if she will vote for new taxes. Owens-Hicks says that she is not opposed to some elements of the new tax package; that she supports a capital gains tax; that she is not opposed to cigarette or alcohol taxes. Owens-Hicks says that she will not endorse a gasoline tax. 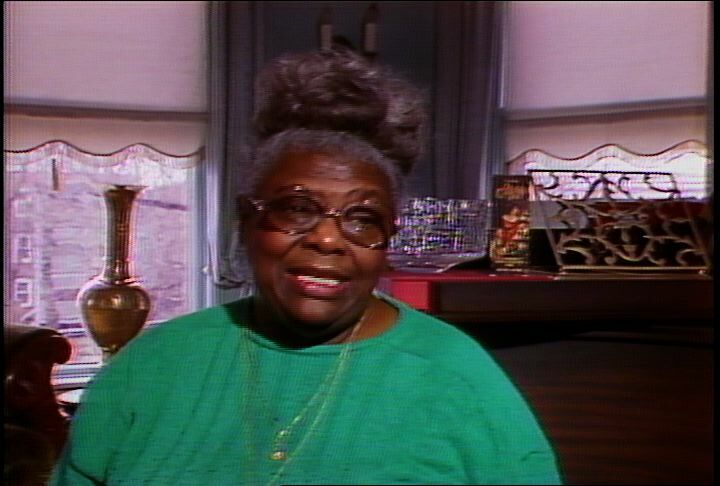 Footage of Louis Elisa (Boston chapter of the NAACP) being interviewed by Vaillancourt. Elisa says that every citizen of the Commonwealth needs to reaffirm their commitment to human services and to their neighbors. Elisa says that the state legislators cannot play politics when there are lives at stake. Description: Harold Washington (Mayor of Chicago) and W. Wilson Goode (Mayor of Philadelphia). The city of Hartford, Connecticut has elected Carrie Perry, an African American woman, as mayor of the city. Marcus Jones notes that Hartford is the only major city in New England with an African American mayor. Jones' report includes footage of Perry at a polling station and at a press conference. Jones reports that Bruce Bolling (Boston City Council) is seen as having the best chance at becoming Boston's first African American mayor. Interview with Bolling, who says that he might run for mayor someday, but that he is concentrating on his agenda in the City Council. Jones notes that Bolling differed with Mel King (candidate for Mayor of Boston in 1983) and other African American community leaders over the issue of Roxbury's secession from Boston. Footage of Bolling, King, Andrew Young (Greater Roxbury Incorporation Project) and Charles Stith (Union United Methodist Church) on the Phil Donahue Show in 1986. Jones notes that the minority community in Boston is becoming impatient for an African American mayor. Interviews with Charles Weeks (Black Political Task Force) about the chances of Boston electing an African American mayor. 1:00:09: Visual: Shots of Harold Washington (Mayor of Chicago) celebrating his victory at the polls; of W. Wilson Goode (Mayor of Philadelphia); of an African American man official from the campaign of Carrie Perry in Hartford. Shot of Carrie Perry (Mayor of Hartford) entering a polling booth. 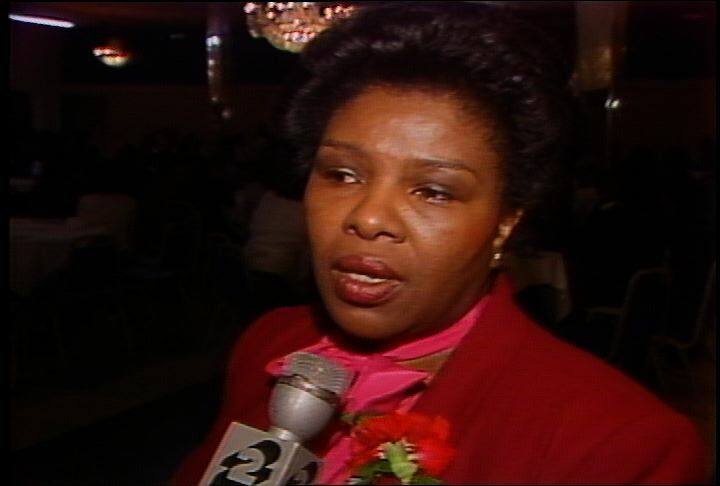 Marcus Jones reports that Carrie Perry is the first African American to be mayor of Hartford; that Hartford is the only major city in New England with an African American mayor. V: Footage of Perry at a press conference. Footage of Bruce Bolling (President, Boston City Council) being interviewed by Jones. Bolling says that the city of Hartford deserves a lot of credit; that Hartford voters have looked beyond race in electing city officials. Jones reports that Bolling is seen as having the best chance of becoming Boston's first African American mayor. V: Footage of Bolling saying that he is not preoccupied with the thought of running for mayor. Bolling says that he is pursuing his agenda in the City Council. 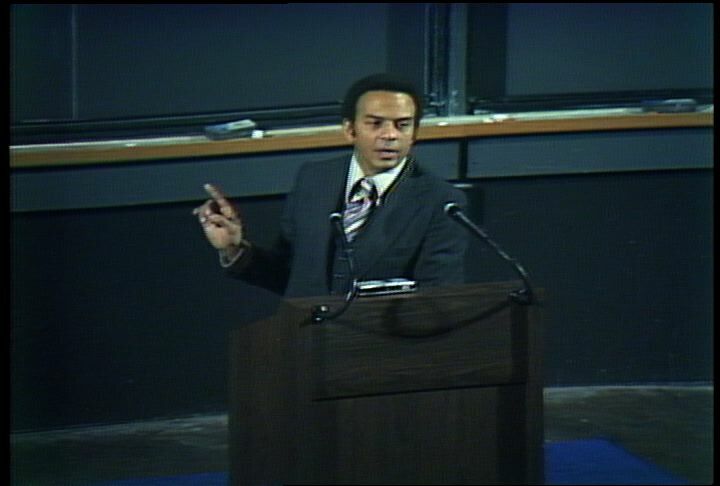 Jones notes that Bolling was once seen as a successor to Mel King (candidate for mayor of Boston in 1983); that King and Bolling differed publicly on the issue of Roxbury's proposed secession from Boston. V: Shot of King campaigning in Roxbury in 1983. Footage of Bolling, King, Charles Stith (Union United Methodist Church) and Andrew Jones (Greater Roxbury Incorporation Project) on the Phil Donahue show on October 30, 1986. Bolling says that African Americans and voters from other races supported King's candidacy in 1983 because they wanted a change in the city. 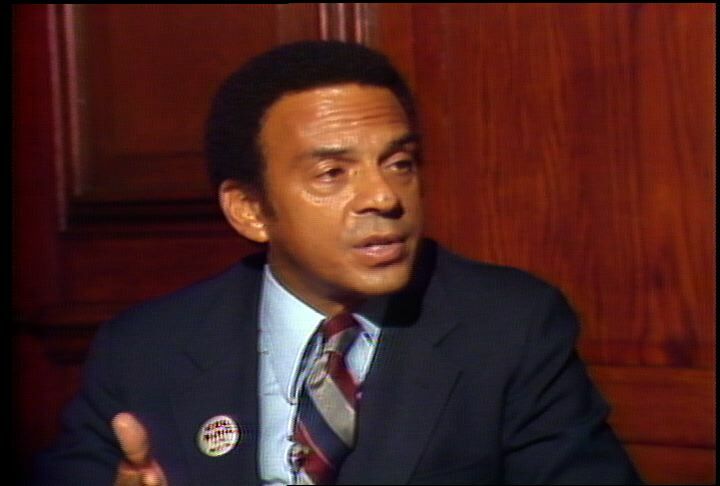 Footage of Charles Weeks (Black Political Task Force) saying that there will be an African American mayor in Boston; that the African American mayor will need to be the mayor for all residents, not just African Americans. Jones notes that the Black Political Task Force endorsed Bolling's last bid for re-election to the City Council. V: Footage of Weeks saying that whites are becoming more accustomed to seeing African Americans in positions of authority; that an African American will eventually become mayor of Boston. Footage of Bolling saying that it is possible that he might become mayor someday. Bolling adds that an African American will become mayor of Boston in the future. Footage of African American audience members debating on the Donahue show. Marcus Jones notes that the minority community in Boston is becoming impatient for an African American mayor.